THIS INSTALLATION MANUAL EXPLAINS EVERYTHING YOU NEED TO KNOW BEFORE INSTALLING GOMDOLIGHT. FAILURE TO READ THIS DOCUMENT BEFORE INSTALLING WILL ALWAYS LEAD TO VARIOUS UNEXPECTED PROBLEMS. I WILL NOT ANSWER ANY QUESTIONS ALREADY ADDRESSED IN THIS DOCUMENT. Introducing GomdoLight, the most advanced, user-friendly, fully-customizable system enhancement pack for KOREAN smart devices. GomdoLight modifies official stock firmware to remove all the unnecessary components preloaded by operator/manufacturer, and reorganizes key system parts to achieve the most ‘basic’ Android OS with manufacturer’s flavor. This will somewhat improve battery life, system stability, and responsibility. But most of all, you will find your device more comfortable to use. VEGA’s Design Home remains intact, with all associations with now-deprecated AppsPlay removed. 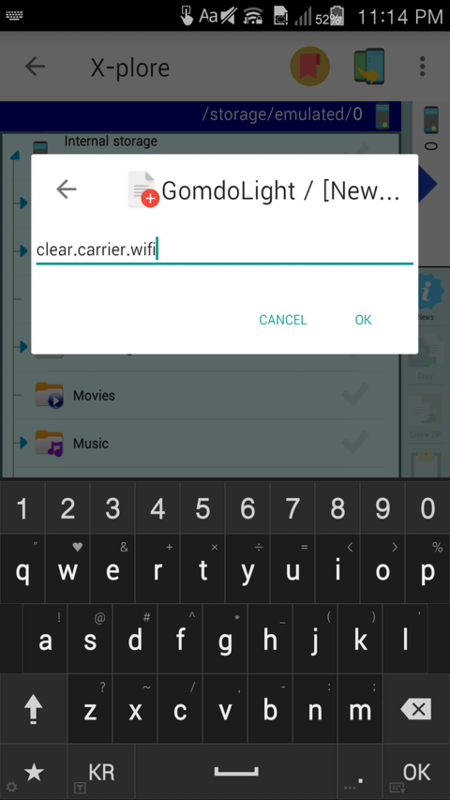 GomdoLight App Manager provides essential apps at your fingertips, without any Internet connection or additional sign-in procedures. GomdoLight will help you protect your privacy by reverting your dangerous choices back. GomdoLight automatically checks for a new version, and lets you easily upgrade if there is one. Everything is powered by the sophisticated GomdoLight Engine. With the Simple Text Widget app, you can put any text on the home screen. Also note that you still have access to all your favorite mini window apps. Just create an empty file, giving them a special name, then restart the device… Wish granted! GOMDOLIGHT INSTALLATION PROCESS ALWAYS INVOLVES MODIFICATION OF SYSTEM PARTITIONS. ONCE A SYSTEM PARTITION IS MODIFIED, YOUR WARRANTY WILL BE VOID. Here you can find what components are added, modified, or removed when you install GomdoLight. The following lists illustrate all the apps and other components added to system, when installing GomdoLight. After installing GomdoLight, the following components (if available) will be removed from the system partition, and lose their status as ‘preloaded components’. However, if you need them again, you can still reinstall those via Play Store. NOTE: If those components are updated before installing GomdoLight, each updated component will have its updated copy on the data partition, and it will be treated as a user-installed app. You will have to remove such components manually. GomdoLight takes out many features from the stock firmware. Therefore it is generally not advisable for Android first-timers. This section explains how to perform a fresh installation of GomdoLight. Installation process can largely be divided by the following categories: 1) DATA BACKUP AND INITIAL PREPARATION, 2) STOCK FIRMWARE INSTALLATION, 3) PREPARING CUSTOM RECOVERY, 4) CONFIGURING AND INSTALLING (FLASHING) GOMDOLIGHT. From now on, this manual will cover EVERYTHING you need to meet all conditions required to successfully install GomdoLight, and provide a step-by-step explanation for each stage. This document is indeed lengthy, however on the other hand, is designed from the ground so that it could be understood very quickly, even for those who never installed a custom firmware before. Your confidence (NOT overconfidence) is the most important thing when installing GomdoLight – please do not falter, just ease yourself and follow the instructions. You have to have a device compatible with GomdoLight, of course, to install GomdoLight. In rare cases GomdoLight might work on other devices but it is not guaranteed. Installing GomdoLight on devices not listed as compatible, is neither recommended nor supported. Before you begin, you would want to make sure that the whole installation process will not get interrupted by a simple and silly oversight, and that nothing will happen to your precious data when something goes wrong. Therefore, first we will back up your critical apps, data, and files, and download some tools (and install some of them) and grab files that are essential to install GomdoLight onto your device. * NOTE: This section is shared by numerous GomdoLight installation manuals on this website. You will see all links for SEC(Samsung Electronics), LGE(LG Electronics), Pantech devices. Choose what is appropriate for you. Nothing is perfect after all, and something may go wrong during the installation process. Before you continue, you would want to back up your stuff if it means anything to you. for apps that are easy to install and configure, you don’t need to back them up. for apps with own backup/restore/export/import features, you should use those features. if you’re on an LGE device, you can stop worrying and just use its built-in LG Backup. This can back up everything. if your device is rooted, or if you can root your device, you should consider ▷ Titanium Backup app. This powerful app can back up everything but requires root. if your device has a custom recovery installed, you should try its Nandroid backup feature. This creates a complete snapshot image of entire device. Remember, the more, the better. Use as many backup methods as possible and keep multiple copies of backup data in multiple places. However, please keep this in mind: the INTERNAL STORAGE of your device may be FORMATTED when you install stock firmware, unlock bootloader, or factory reset the device – it is NEVER A SAFE PLACE to store your backups and personal contents. It is obvious you need this GomdoLight Installer in order to install GomdoLight. ▷ Click here to open the Download section of this document in a new window. Warning! By downloading the GomdoLight Installer you automatically agree to the ▷ GomdoLight License Agreement. If you do not agree, do NOT download the GomdoLight Installer. In this case you will not be able to install GomdoLight. After downloading the GomdoLight Installer, now is a good time to copy it to the internal storage of your device. This will make the installation process significantly easier (in most cases). Also, if your device has an external SD card inserted, copy the GomdoLight Installer to that external SD card as well. You should download and install the device driver package before installing. These tools are used to flash stock firmware images and/or custom recovery images. For SEC devices: You will need the ▷ Odin tool. Download it here. For LGE devices: For most of the cases, you will need the ▷ LG Flash Tool 2014. Some devices might require something else, but in that case this manual will provide with right tools when you need them. For Pantech devices: Not needed. For these tools to access your device, you need to let them communicate with your device through ADB (Android Debug Bridge). To do this, first ▷ unlock the Developer Options, then inside the Developer Options find and enable ‘USB debugging’. GomdoLight requires a compatible version of stock firmware already installed on the device prior to its installation. This is because GomdoLight is essentially a large-scale patch which is installed by modifying the pre-existing stock firmware. Therefore, if your device has an incompatible version of stock firmware, or, a completely different type of custom firmware, such as CyanogenMod, MIUI, or AOSP, you MUST install a compatible version of stock firmware before installing GomdoLight. And, aside from this, the stock firmware installation process explained from now on is very important for when you uninstall GomdoLight or update the base stock firmware. You are strongly advised to carefully read the explanation below and get yourself somewhat accustomed to it. First, on your device, check Settings → About phone/tablet/device → Software information/info/version to find the version of the firmware currently installed. (Specific menu structure and names may vary) Then, from the ‘firmware compatibility table’ below, find your device model. If the firmware currently installed has the same version number/code with what is described in the table, you’re just good to go, and safely skip to the next step. The ‘firmware compatibility table’ below illustrates the range of version compatibility for each supported device. Your firmware version might be too low, or your device may running a custom firmware environment other than GomdoLight. In this case you need to install or update the stock firmware first. To do this, follow these steps below. 1) First, scroll up a bit to the firmware compatibility table above, and find a link to the stock firmware package for your device model. With this package you can (re)install the entire system/OS area. This package can also be used when uninstalling GomdoLight and reverting to stock firmware (which, is generally a poor decision). This could take some time since the file should be very large. 3) Connect the device to your PC via USB. You need to have the driver for your device installed on your PC at this point. If your device has a custom recovery installed, copy the package to the device’s internal storage or external SD card (external SD card only if device is encrypted), reboot to recovery, and just install the package as you install any other custom firmware. If your device does NOT have a custom recovery, unpack the GomdoLight Sideloader tool you have downloaded. Then, find the _SIDELOAD folder, and put the package into that folder. Finally run _GomdoLightSideloader.cmd and follow the on-screen instructions. This is probably the easiest method. Also, you can temporarily boot into custom recovery using ▷ custom recovery tools designed to work with GomdoLight and install the package as if your device has a custom recovery installed (like explained above). To run the GomdoLight Installer, a custom recovery should be loaded on your device first. For Pantech devices this is very easy as you do not need to root your device or unlock bootloader at all. Just download a right custom recovery package for your device, and run the recovery loader/installer script, then you’re done. A ▷ dedicated supplementary document for custom recoveries is available. Download the custom recovery for your device ONLY. Open the archive with your favorite archiver utility, such as BandiZip, 7-Zip, or WinRAR utility. Extract the folder out of the archive. In the folder you’ve just extracted above, you will find ‘_GomdoLightVEGArecovery.cmd’. Run this script to load and install the custom recovery. Your device will reboot twice, then the custom recovery interface will appear on the screen. Some devices might not function properly when you load a custom recovery. Iron2: The custom recovery package provided by GomdoLight is designed to load tekcafe TWRP 2.8.6.0 by default, which shows the highest compatibility with GomdoLight Installer. However, it is reported that some devices fail to load this recovery image. To resolve this issue, a newer version, 3.0.2.0 of tekcafe TWRP recovery is also included in the package. Drag and drop this image onto _GomdoLightVEGArecovery.cmd script to load this particular version. However, please understand you’re very likely to experience serious graphical glitch during installation with tekcafe TWRP 3.0.2.0, though it will leave no actual negative impact to the system after the installation is complete. You’re almost there, and this is the part where you FINALLY run the GomdoLight Installer and install GomdoLight onto your device. There are two ways to run the GomdoLight Installer. This method would be easiest if your device is on a custom recovery. If you have already copied the GomdoLight Installer to device storage, just select ‘Install’ or ‘Install Zip’ from the menu, locate the GomdoLight Installer, and select it. If you didn’t copy the GomdoLight Installer when you downloaded it, please do so now, and the rest is the same as above. This method is also useful when your device has no custom recovery installed and the stock recovery is signed with testkey. On your device, activate the ADB sideload mode. Stock recovery: There should be a menu labeled ‘Apply update from ADB’. PhilZ, CWM: Generally, sideload menu should be inside ‘Install Zip’. TWRP: Generally, sideload menu should be inside ‘Advanced’. On your PC, unpack the GomdoLight Sideloader tool if you haven’t done so yet. After unpacking, look into GomdoLight Sideloader’s folder you just extracted. Inside the GomdoLight Sideloader folder, you will find a folder named _SIDELOAD. Put the GomdoLight Installer into that folder, then run _GomdoLightSideloader.cmd and follow the on-screen instructions. Remember that you’re in recovery mode now. GomdoLight Sideloader will ask you about this. GomdoLight Installer will run automatically. Now you’re finally installing GomdoLight! During the configuration process you will be given a choice of battery indicator styles. However you may not understand what each option means, so here are some screenshots. If you want ‘stock’ battery indicator, select the third option (‘stock’), NOT the fourth (‘Do not overwrite the status bar’) one. ‘Do not overwrite the status bar’ does not replace the related system files, and a lot of GomdoLight’s status bar improvements will become unavailable. This option is intended only for preserving third party aesthetic modifications. Whatever option you choose, you can easily enable/disable adblock with ‘enable.adblock’ and ‘disable.adblock’ flag. You do not have to run the GomdoLight Installer again just to change adblock settings. The GomdoLight Installer automatically reboots the system upon finishing. Your device should display some status messages, such as “[GomdoLight] System ready.” in toasts bubbles. There should be a file named GomdoLightSITREP.txt in /sdcard/GomdoLight, which may be used for diagnostic purposes. Now you have successfully installed GomdoLight! * If you chose to disable ‘Email’, or ‘Internet’, those are left active on the first boot. This is intentional; they remain active on the first boot for better compatibility and error handling. When you restart the device they will be disabled. GomdoLight is very well maintained and updated regularly to meet your needs. Upgrading to the latest version of GomdoLight is generally easy. However you should carefully follow the upgrade instructions for each release. There are two ways to upgrade GomdoLight: automatic and manual. GomdoLight will automatically download the latest GomdoLight Installer. 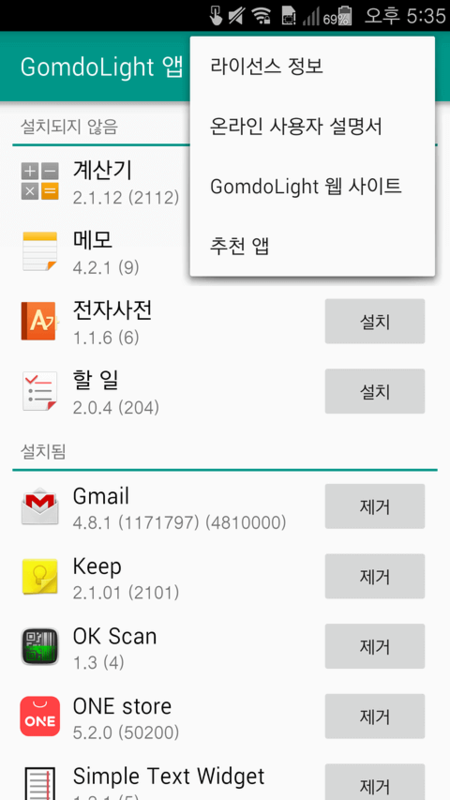 When it is downloaded completely, GomdoLight will show you how to apply the update (update instructions). In /sdcard/GomdoLight, create an empty file and name it ‘gomdolight.online.upgrade’, then reboot the device. GomdoLight Installer will automatically run. Select the device model, and from the main menu choose the ‘Upgrade/Repair’ option. GomdoLight will NOT automatically download the GomdoLight Installer, to protect you from being charged unexpectedly. When the download is complete, GomdoLight will show you how to apply the update (update instructions). Reboot the device. GomdoLight Installer will automatically run. Sometimes, you might want to do this all by yourself, or the new release might not support upgrading by GomdoLight Online Upgrade. Download the GomdoLight Installer from this website. Run the GomdoLight Installer. This is done by manually running it in the custom recovery, or by using the GomdoLight Sideloader. 2) If the new version requires a base firmware update, this is essentially the same thing as a fresh installation of GomdoLight. Therefore, first ▶ Uninstall GomdoLight completely, and start from scratch as if you’re installing GomdoLight for the first time. Sometimes an OTA update might be still available after flashing the stock firmware. In this case refer to the firmware compatibility table to find out whether if the update will be compatible with GomdoLight. Most of times just ‘Upgrade/Repair’ option will do, but sometimes there might be some special instructions, and there might be times that a new version of GomdoLight requires a base firmware update. Remember, it never hurts to read the upgrade instructions. First, back up everything, in case the stock firmware might fail to flash properly. 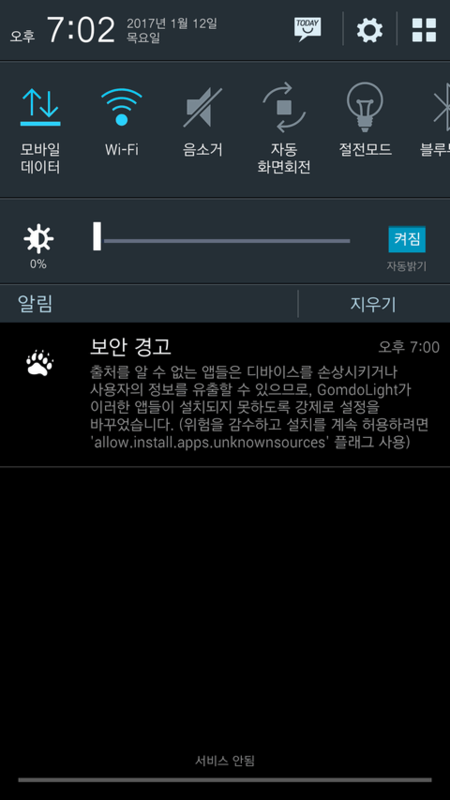 Then, ▶ install the stock firmware to completely uninstall GomdoLight. License for GomdoLight can be found below. This document is very important as it defines your legal rights and obligations; please read very carefully. All third party components are credited in the GomdoLight Users’ Community (Korean). It is recommended that you download the GomdoLight Installer from PC. Remember, ALWAYS DO AN INTEGRITY CHECK before installing GomdoLight. Corrupted or damaged installer can critically damage your device. HOLD ON! If you find GomdoLight useful, how about showing your support by donating some? Even the smallest amount helps me a lot. 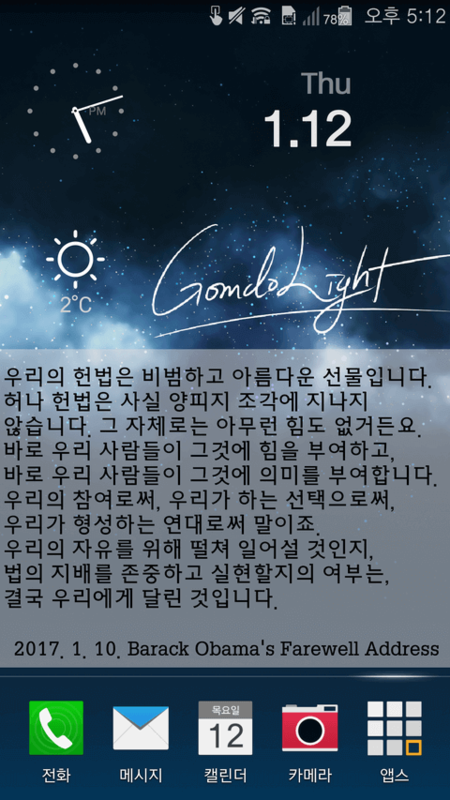 * GomdoLight 업그레이드 방법에 대해 자세히 알아보려면 ▶ ‘새로운 버전의 GomdoLight로 업그레이드’의 설명을 참고하십시오. WARNING: Do NOT mirror the GomdoLight Installer files. GomdoLight Installers should be downloaded only from http://gomdolight.com. DO NOT UPLOAD TO OTHER SERVERS. Changed: GomdoLight no longer automatically displays Online User’s Manual when installed/upgraded/repaired. Improvements: Better optimization and detection avoidance capability. Improvements: Totally new internal structure, enhanced reliability and detection avoidance capability. 과거 업데이트 내역을 주의 깊게 읽는 것도 문제 해결에 큰 도움이 됩니다. GomdoLight Sideloader. Used when ▶ Directly installing GomdoLight onto the Sideloader-supported devices. Detailed information on EasyMod and a download link for the EasyMod template file. For more information refer to ▶ ‘Installing third party mods’ section. Support is done in the forums. DO NOT USE PM TO ASK QUESTIONS. Use the board so that others can participate in the support process, and the solution to your problem is made available to the public.